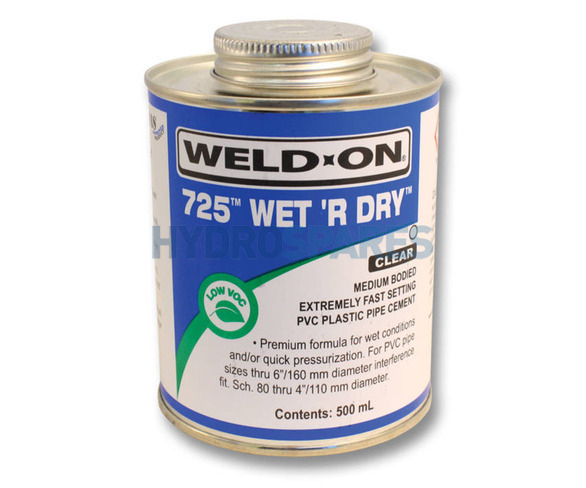 Weld-On® 725TM "WET 'R DRY" Clear: Medium bodied, extremely fast setting, low VOC PVC cement for all classes and schedules with interference fit through 6" (160 mm) diameter, Schedule 80 through 4" (110 mm) diameter. Premium formula for wet conditions and/or quick pressurization. Suitable for irrigation, plumbing, and pool & spa applications. Can be used without primer on non-pressure systems.